Dr. Schutz was one of three McMaster researchers to receive the 2011 Early Researcher Award from the Ontario Ministry of Research and Innovation. This $140,000 grant, Perceiving percussive sounds: Studying our perception of impact events, will support students working in the lab from 2011-2016 by providing funding for academic study, conference travel, and the equipment necessary for supporting their research projects. These students will be able to carry out their work using the renovations and infrastructure provided by our CFI-LOF award including sound booths, computers and testing equipment, and a full complement of professional level percussion instruments. These students will also have a chance to assist with translational applications to health-related questions through our work with collaborators such as Dr. Laura Silverman (funded by the National Institutes of Health) and Dr. Kristi Buckley (funded by the American Academy of Audiology). 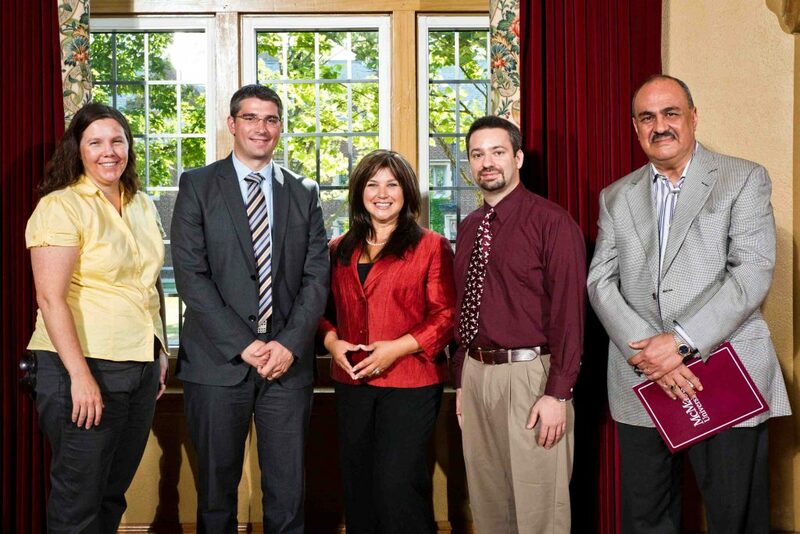 McMaster University’s three Early Researcher Award recipients (Dr. Joanna Wilson, Dr. Gianni Parise, and Dr. Michael Schutz) along with MPP Sophia Aggelonitis and Dr. Mo Elbestawi.